Getting started with an automation project can be difficult and sometimes confusing. There are many factors that might mystify someone interested in working with us, or with any automation expert. We at Allied Technology understand this and try to make the process as painless and straightforward as possible. Understand that it is not uncommon for issues to arise, which may require alterations to a project. Any requests for changes are well documented through email, and confirmed with an update to the proposal, so there are no surprises. Visit our website to see the many ways Allied Technology can help you finish your project. We offer pre-engineered solutions with installations around the country that are proven to work. We also offer off the shelf solutions from our Cobot Store so you can get started with your own R&D and get us involved at any time if you need help with custom designs or integrations of the components. Custom Solutions are how we made a living for over 20 years. If you can think it up, we can design a solution to meet your needs. Once you have gotten familiar with our products and automation solutions, it’s time to get in touch with our automation experts. Call or email Allied technology so that we can help offer ideas and suggestions to get your project started and help you succeed with the solution you want. We recommend sending us photos, videos and details about the process you are trying to automate and how you want it to function. If convenient, we can visit your site and see your process, or you can send us product for testing to make sure we can work with it. Once you have given us enough information and resources about what you plan to automate, we then provide you with a proposal or quote. We will work together to make sure everything we have included is the solution you want, and you would write a purchase order to get the project moving forward. We will hold a kickoff meeting with everyone involved. Our engineering team will start the concept design phase for any custom solutions needed and integrate all the components to work within your floor space. A design review will take place to confirm or make any changes to the project. Then our engineering team will work on the final design, electrical design and programming of the system. Meanwhile, our manufacturing team will begin machining and ordering materials. The final design review will take place to confirm the project and make a schedule for implementation. Production will begin after the final design has been approved. All of the required parts will be machined, assembled, tested and debugged. Once everything is operating successfully, the system will be prepared for acceptance, delivery, and installation at your facility. 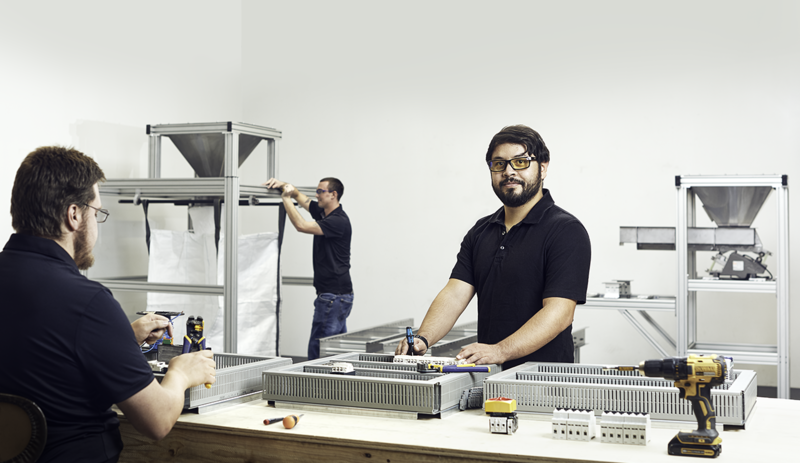 After your machine has been shipped from our facility, acceptance and installation of the system will take place, which will finalize the project so that we can begin working on your next automation project.